Greetings, listeners. It’s been a quiet (silent) few months, but we’re excited to announce that we’re back on the air waves as well as the internet waves this quarter with fresh episodes for our fourth season! Our latest episode was a big experiment. 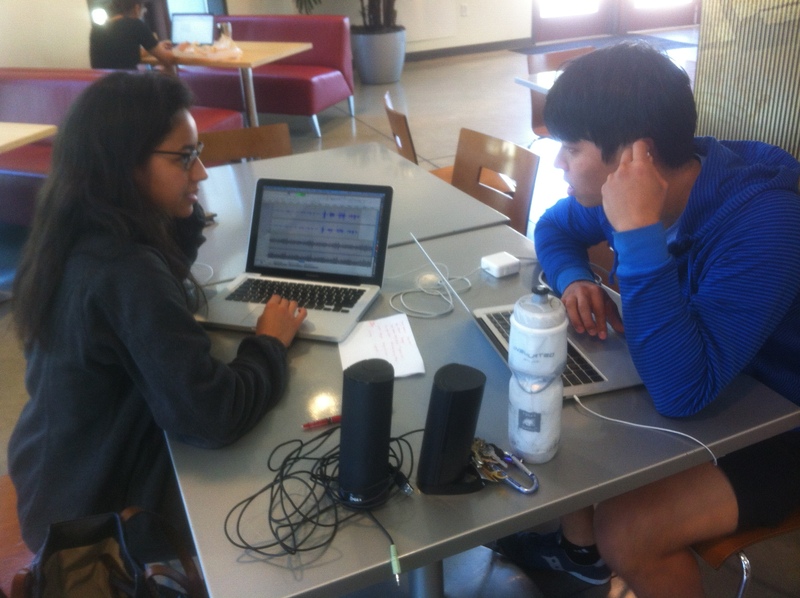 Channeling the vibes of Silicon Valley, we held a 24 hour radio hackathon. (Channeling the vibes of real life, sleep was deemed mandatory). Mallory and I led an environmental storytelling boot camp on Saturday morning, then we broke into teams to produce a 3 minute piece on the theme: Getting Around. Mallory leads an interviewing workshop. Photo by Diane Wu. On Sunday, we sat in the sun together to listen to what everyone had made, and each piece was a delightful surprise. We’re sharing these quickly crafted bits with you today. We bring you stories from trains, bicycles, and butterfly-crusted Texan cars. 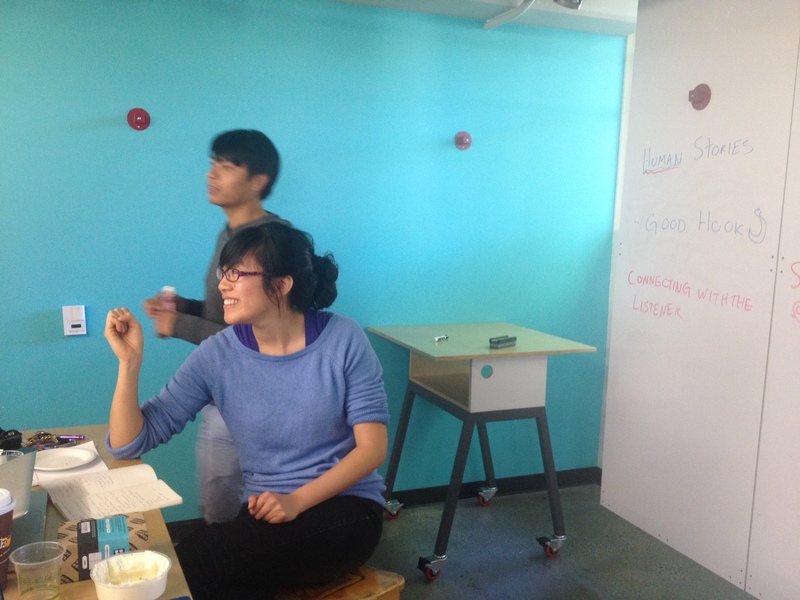 Defining the elements of quality environmental storytelling (and putting those d.school whiteboards to use!) Photo by Mallory Smith. Bonus points were awarded for laughter, the phrase “bicycle baron”, sound effects, and not using the word “environment”. Listen below to see if anyone was able to get all of them! Team C doing some last minute editing before the listening party. Photo by Diane Wu. Hosted by Calvin Hu and Mallory Smith, and produced by the whole Stanford-based team: Shara Tonn, Lingzhi Jin, Derek Mendez, and Diane Wu. Resources mentioned include http://www.monarchwatch.org. We’re going to be a weekly show again through June, so do tune in to KZSU 90.1 FM or stream our show Mondays at 6 PM, and subscribe to our podcast in the iTunes store. Categories: Podcasts | Tags: Bay Area, bicycle, boot camp, buses, california, Caltrain, cars, commute, hackathon, migration, monarch butterfly, trains, transportation | Permalink.